Whippersnappers winter wonderland is an annual Whippersnapper event. Tickets will be on sale from the 1st of October 2014. On the edge of Dulwich Park by College Gate stands the old Victorian Park keeper’s Lodge. 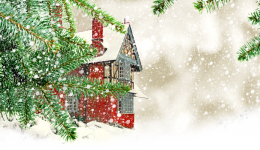 A Magical ‘Gingerbread House’ where each December Father Christmas and his Elves climb down the chimney and entertain children with their Winter Wonderland Experience. On arrival guests will be greeted by Santa’s elves who will serve mulled wine, hot chocolate and mince pies and lead them through Santa’s Garden Gate into the magical world of Whippersnappers Winter Wonderland. In the garden elves will entertain with music and fun (making magical willow wands), while animals graze around Santa’s Sleigh as it is prepared for the Big Night Flight. Children dress-up to help the Elves in their Log Cabin Toy Workshop. Featuring in their own personal photo shoot they will take away a free photograph as a memory of the day. Following Santa’s Sooty Footsteps upstairs to the Wonderland Waiting Room the children meet *Starfrost our Christmas Tree Fairy who gets busy painting faces with her fairy dust. Children have a chance to make a miniature Christmas Stocking and a Christmas Wish for Santa to hang on his tree, build a ‘snowman’ and enjoy a christmas sing-a long. While Santa’s Elf rushes to and fro ringing his bell to call each child into Santa’s Grotto to meet the man himself. Meeting the big man in red the children hang their Christmas Wishes on his Tree, and with special Santa words of wisdom receive a natural magical present. Then it’s down stairs to our Christmas arts & crafts/ toy shop clutching goodie bags to pick up the children’s Gingerbread Christmas tree decorations and framed Sleigh photographs .